The fashion world has always been the perfect place to express creativity in its wildest. 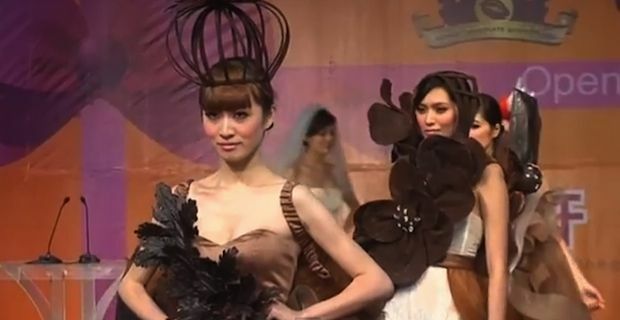 Yesterday it was the turn of a peculiar crossover with the food industry and designer dresses made with chocolate were presented on the catwalk at the opening of World Chocolate Wonderland in Shanghai. The designer behind the delicious creations is Tina Fu, an extremely talented lady based in Shanghai, but originally from Hong Kong. Despite never being formally trained, Tina Fu has quickly become popular thanks to her outstanding skills. Five years ago she opened the fabulous Tina Couture shop in Shanghai's Xuhui district and only six months later, she was asked to design the dresses for Chen Chen, one of China's top television presenters, which obviously helped paving the road to stardom. CLICK HERE TO WATCH "Tina Fu's chocolate dresses rock Shanghai catwalks - Video"
She is now one of the most respected professionals in the business and her evening gowns are notorious. About working with chocolate for the World Chocolate Wonderland's opening, she declared: "I think that the most difficult part of using chocolate on clothing is the technique involved, because chocolate is not a material for making clothing after all. So I think the most difficult part is pasting the chocolate into the clothing and combining them together." At the opening, models rocked the show without suffering any wardrobe malfunction involving melting or breaking, which is the main problem with this sort of garments, as model Yu Mengxian explains: "The most difficult part of walking the catwalk in chocolate is that I'm afraid that chocolate would drop or break into pieces, than it could destroy the original design". Model Zhang Xiaoxiao also commented on the show, and appeared less worried despite this being the first time she's ever walked down the runaway dressed in chocolate: "My strongest feeling after wearing clothes is that I might be willing to eat them. The best part of doing this catwalk is the thick aroma of the chocolate. It's the most intuitive way to convey this joyful atmosphere to the audience."